Elizabeth Hopkins is a partner at Kantor & Kantor. After a long and fulfilling career at the United States Department of Labor, where she gained substantial experience working on pension, healthcare and other ERISA issues, she joined the firm in 2018. She represents clients who have been denied pension, healthcare, disability and life insurance benefits. She has practiced in the ERISA field since 1989 and is a passionate, knowledgeable and creative advocate for those who have been denied the employee benefits to which they are entitled. 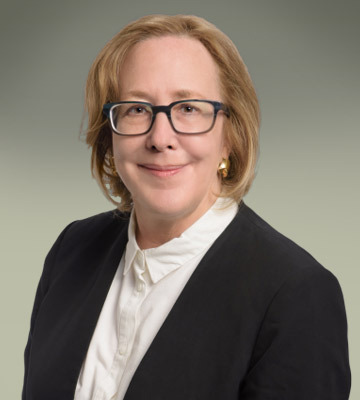 Prior to joining Kantor & Kantor, Elizabeth worked for three decades at the Department of Labor, where she specialized in appellate litigation and ERISA. From 2002 through 2017, she headed the ERISA appellate and amicus program, where she oversaw nationwide litigation designed to advance the interests of workers and their families with regard to their employee benefits. She filed over 100friend-of-the-court and party briefs and presented arguments in federal courts of appeals throughout the country and supervised others in doing so. She also participated in formulating departmental positions and briefing ERISA issues in the Supreme Court, where she worked on many of the important ERISA cases of the last two decades. In addition, she worked on a number of regulatory issues and court challenges to ERISA and Affordable Care Act regulations adopted by the Department of Labor. During her tenure at the Department of Labor she was a frequent speaker at ERISA conferences and bar-sponsored events, and taught numerous classes on ERISA topics and brief writing. She was also the recipient of many awards for her work on particular projects and cases, and was one of the first recipients of a prestigious annual award for brief writing. Throughout her long career, Elizabeth has been motivated by the desire to help others and to fight for justice for individuals. In addition to her paid work, Elizabeth has been involved in many activities with the District of Columbia Bar and the American Bar Association. She is a member of American College of Employee Benefits Counsel, where she has served as a judge on their annual writing competition. She has been a contributing writer and editor on the American Bar Association’s, Employee Benefits Law, and has recently been appointed to serve on the Board of Senior Editors for that publication. Elizabeth is also a life-long volunteer for a wide range of organizations, from the Special Olympics, to a homeless shelter, to the Red Cross, to an after-school program at a Los Angeles public high school. Most recently, she traveled to Dilley, Texas to represent detained migrant women and their children claiming asylum. Elizabeth is very excited to bring her skill and experience to representing clients at Kantor & Kantor with their ERISA claims. Georgetown University Law Center, Washington D.C.